Virtuoso Program classes and rehearsals take place after school between 3:00-9:00pm. Each student participates in orchestra, a string quartet, music hour (performance and musicology class), and solo repertoire rehearsal with the staff accompanist, in addition to the hours dedicated to private practice. San Domenico is a day and boarding school, though Virtuoso Program students are encouraged to live on campus, allowing time for intensive after-school rehearsal, practice, and academic homework. All activities are carefully planned by the Virtuoso Program Director and Music Conservatory Director. Each year the weekly class schedule is tailored around the public performance schedule as well as the musical and educational needs of the program's group of students. Superior facilities support superior students. San Domenico's Music Conservatory and adjacent Carol Franc Buck Hall of the Arts provide an ideal setting for intensive music study. Performances, recitals, orchestra rehearsals, and chamber music coachings take place in 300-seat Bettye Poetz Ferguson concert hall, opened in 2004, which features professional-level acoustics. The Music Conservatory houses numerous practice rooms, teaching studios, and an extensive music library. Achievement of advanced musical technique is attained through intensive training and practice undertaken at an early age, so the developmental years between age twelve and eighteen are especially critical for musicians. The Virtuoso Program gives talented young musicians the opportunity to reach a pre-professional performance level without abandoning other interests. 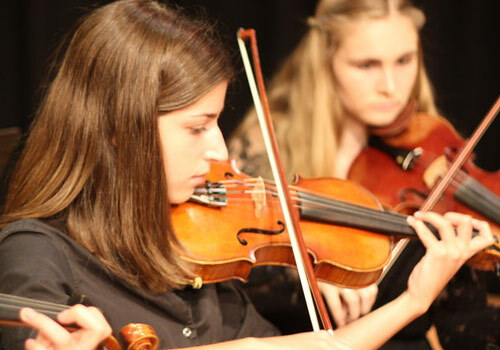 The Virtuoso Program has been thoughtfully designed to address the diverse and specialized needs of the young artist who wants to devote significant time to their music, challenge themselves with the rigorous demands of performance, and who will flourish in an intellectually stimulating upper school. San Domenico's academic classes are small, and the availability of honors and AP coursework across the curriculum makes it possible to tailor a student's program of study to their particular abilities and requirements.